How was your Sunday? We had a very enjoyable family-oriented day that was a blessing to all, especially for our new members and single moms. It’s amazing what a family or church outing can do to help newcomers integrate into the community of believers. Working mothers who rarely have an opportunity to spend quality time with their kids, are offered a chance to enjoy a little fun with them. It helps them to bond with each other and build strong relationships with other believers that might be able to model a Christian lifestyle. On April 30, Mexico celebrates Children’s day. They are usually treated to a day off or to a variety of activities organized by their schools. Some sponsor field trips while others host piñata parties. On behalf of the church, we always try to have a little something for our kids that is meaningful. We want to them to know how much we love them, and how much they mean to us. We were a little late this year, but we organized a short trip to a brand new park that a local dairy firm has built and made available to the general public. Unlike other theme parks that charge a sizable fee, the “Jersey Park” only requires four caps off of any of the dairy’s milk or juice products. Brother Hernan turned out to be our hero because he had been saving enough caps for everybody, including the adults in our group. 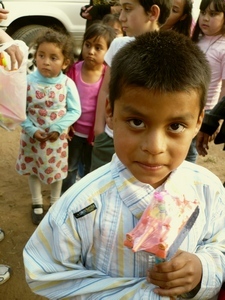 Later in the day, Miriam and the ladies from church handed out a few simple toys to the children. It was the prefect ending for a perfect day. 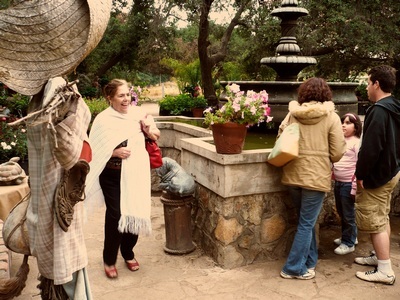 The Guadalupe Valley is only a 15 o 20 minute trip from Ensenada, and it is full of places to visit and enjoy. Although it is primarily wine country, there are plenty of other attractions as well. 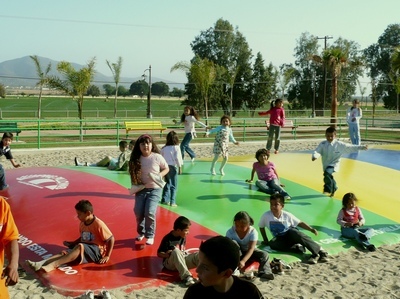 We hold our summer family camp each year at Rancho Tierra Santa, which is a Christian campground equipped with dorms, kitchen, chapel, and swimming pool. This year, family camp will be held on July 21-25. The cost per person will be $40 dollars, not counting the food. For Americans this fee may seem cheap, but for working families in Mexico it translates into a sizable sum. For a family of five, it represents a week’s worth of labor. We can keep the costs down by receiving non-perishable food donations such as pinto beans, rice, flour, pasta, canned goods, etc. If you would like to help with this effort, please let us know. We deeply appreciate the love and care that you show to our Mexican brothers and sisters. You are more than welcome to come and join us for camp! The colonia Jalisco church will be celebrating it’s 20th Anniversary on the last Sunday in August. It seems like it was just yesterday when Miriam and I started the congregation in my parent’s back yard in 1988. We have only celebrated the anniversary once since we began, but we would like to make this a regular event every year as the Lord provides. Anniversaries always provide an opportunity to reflect on the blessings of God throughout the year, exercise faith and hope for tomorrow, and get re-acquainted with old friends. We will be having it at the church building this year to help cut the costs involved. I will probably put together a little video presentation of some of the highlights of our congregation’s history. Please pray that this will be an uplifting time for all.